This modern yet classy mirror is back-lit, and wall hung featuring a laminated frame and white acrylic light diffuser. Includes fluorescent lamps and wiring junction box (LED lights are optional). Installation may require wall blocking. Frame: 32"W x 4'D x 72"H. Mirror: 20"W x 60"H.
Wall-mounted Illumination Mirror with laminated frame and a 4” frosted border. The 6500K cool white LED back lit mirror includes a reflective area of approximately 27.88 “ W x 65.6” H. 37” W x 73.25” H x 2.313” D. Approximate weight: 185 lbs. Horizontal Version Available. This wall mounted mirror features back-lit LED lights. Back lit mirror. 32"W x 5"D x 84"H.
Mirror - 36" x 54" x 1/4"
36 X 54 X 1/4 mirror w/ polished edges & mounting hardware. Mirror - 36" x 72" x 1/4"
36" X 72" X 1/4" mirror w/ polished edges & mounting hardware. 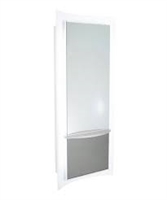 Mirror - 36" x 66" x 1/4"
36" X 66" X 1/4" mirror w/ polished edges & mounting hardware. 36" X 60" X 1/4"mirror w/ polished edges & mounting hardware. Cambridge 3/8" radius-front frosted glass ledge w/ hardware, 24"W x 6". 36 X 48 X 1/4" mirror w/ polished edges & mounting hardware. 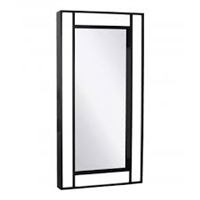 Mirror - 36" x 42" x 1/4"
36" X 42" X 1/4" mirror w/ polished edges & mounting hardware. 30 X 48 X 1/4 mirror w/ polished edges & mounting hardware.